While the height of the Ram statue would be 151 metres, its overhead umbrella would be 20 metres while the pedestal would be 50 metres, said Additional Chief Secretary, Information, Avaneesh Awasthi. The statue will be made of bronze, he added. The proposed statue will be the tallest in the world. 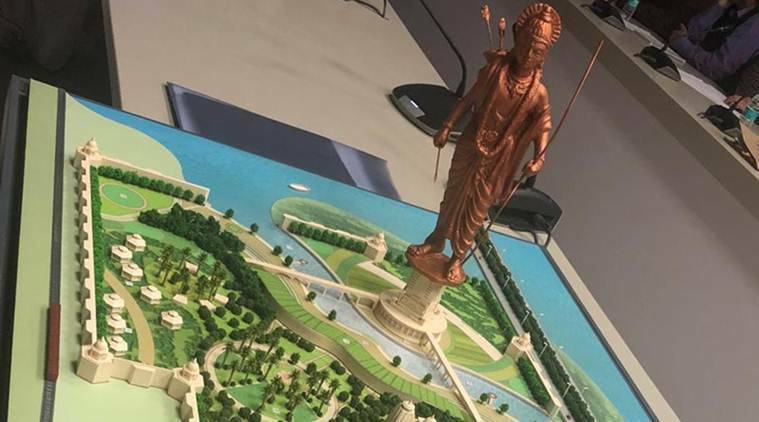 Chief Minister Yogi Adityanath finalised the details for the construction of a 221-metre long statue of Ram in Ayodhya on Saturday. According to the official statement released by the state government, there will be a provision for a “modern museum” inside the base that will showcase the history of Ayodhya and the entire “Ikshvaku Vansh” right from King Manu to the present status of “Ram Janmabhoomi”. The finalised sample for the proposed Ram statue in Ayodhya. The proposed museum will also house detailed description of all the “Avatars” of Lord Vishnu and will also have arrangements for depiction on the topic “Bharat ke samasta Sanatan Dharma” using state of art techniques. “For the selection of appropriate land for this statue, soil testing, as well as wind tunnel testing, is going on at present,” said the official spokesperson of the government. Prime Minister Narendra Modi, had on October 31, inaugurated an imposing 182-metre statue of Sardar Vallabhbhai Patel, the country’s first home minister, in Gujarat.